Product Spotlight: QC-CALC 3.4 Released!! 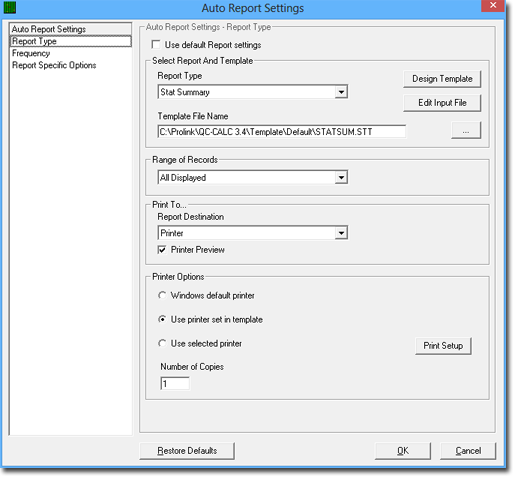 The Reporting and Exporting screens have been completely re-designed and include new options for both range of records and frequency of report/export. Pictures can now be saved at the dimension level and displayed by floating your mouse over the dimension. "Use Same Settings.." has been replaced by a much more flexible defaults mechanism allowing you to set default settings for most databases and only override those that are different. New dynamic filter tabs have been added to QC-CALC SPC allowing you to use a tab interface to switch between views. For a full list of new features, please see our QC-CALC 3.4 New Features page. Product Spotlight: QC-Gage 3.4 Released!! Full support for GE Fanuc GagePort hardware (both digital and analog) has been added. In addition, full support for importing spec plans and data from GE Proficy ShopFloor/Cimworks VisualSPC allow you to transition from older software to QC-Gage and leverage your existing hardware investment. Full support for the Heidenhain MSE 1000 has been added. New spec plan features such as inspection groups and fixture groups allow you to choose different sets of features within the same spec plan based on the situation. New ability to generate spec plans directly from Discus and InspectionXpert ballooning software packages allows you to set up a workflow system and reduce the time to set up your measurement system. The popular Administrative Tools interface that made its debut in QC-CALC 3.2 has been added to QC-Gage 3.4 giving you the ability to manage your workstations from a central location. For a full list of new features, please see our QC-Gage 3.4 New Features page. Tip: Synchronize QC-Gage and QC-CALC! Two very convenient but often overlooked features in QC-Gage allow you to control the Windows on your screen while you are inspecting parts. The first option minimizes the main screen when you run a spec plan and the second sends a message to QC-CALC Real-Time to show the corresponding QCC database based on the spec plan currently running. This is convenient because the main QC-Gage screen tends to get in the way when you launch your spec plan, especially if you are tiling the QC-Gage run screen with QC-CALC. This option tells the main screen to minimize itself to the task bar in Windows. When you close the run screen, it automatically pops back up into its previous position. This allows you to switch between spec plans without having to minimize the windows manually. This is convenient because QC-CALC doesn't normally switch the QCC file it is showing until data arrives. Without this feature, QC-CALC Real-Time will still be showing the old spec plan's data until you send at least one part from QC-Gage. 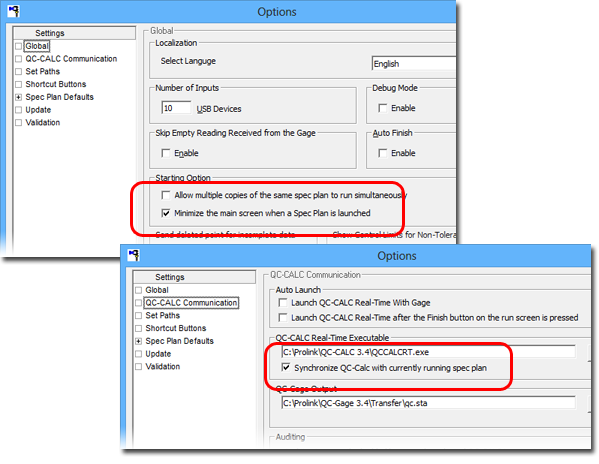 Turning on this option causes QC-Gage to instruct QC-CALC to switch QCC databases whenever a spec plan is launched. If you are tiling the run screen and QC-CALC Real-Time, it will always show the correct part's data in QC-CALC. NOTE: This will not work if it is the very first time you are running a particular spec plan. In that case, there is no database for QC-CALC to open because no parts have ever been received. However, once the database is generated it will show correctly. Check the box that says "Minimize the main screen when a Spec Plan is launched"